Audit assertions make up an important element in the different stages of financial statementThree Financial StatementsThe three financial statements are the income statement, the balance sheet, and the statement of cash flows. These three core statements are intricately linked to each other and this guide will explain how they all fit together. By following the steps below you'll be able to connect the three statements on your own. audits. An auditor uses audit assertions and procedures to perform tests on a company’s policies, guidelines or internal controls, and financial reporting processes. In financial statements, assertions about the recognition, measurement, presentation, and disclosure of financial information are included. When going about an audit of the financial statements, what would be the logical approach? Should we audit each line item separately (i.e., cash, accounts receivable,Accounts ReceivableAccounts Receivable (AR) represents the credit sales of a business, which are not yet fully paid by its customers, a current asset on the balance sheet. Companies allow their clients to pay at a reasonable, extended period of time, provided that the terms are agreed upon. inventory, revenueSales RevenueSales revenue is the starting point of the income statement. Sales or revenue is the money earned from the company providing its goods or services, income, expense, etc.) or is there a more efficient way? In reality, individual line items are not audited separately, and audits are divided into cycles. Cycles are groups of similar accounts that affect each other and thus, audits are typically done using a cycles approach. Some examples of cycles are the RRR (Revenues, Receivables, and Receipts) cycle and the PPP (Purchases, Payables, and Payments) cycle. For example, a revenue recognition not only credits the revenue account but also debits the accounts receivable account. In addition, when the cash is collected from the customer regarding that specific sales entry, the cash account is debited which also credits the account receivable account. Many people often think that the financial statements are the auditor’s responsibility. However, assembling the financial statements is the responsibility of the company management (i.e., the client) and evaluating the financial statements against an established criterion is the auditor’s responsibility. 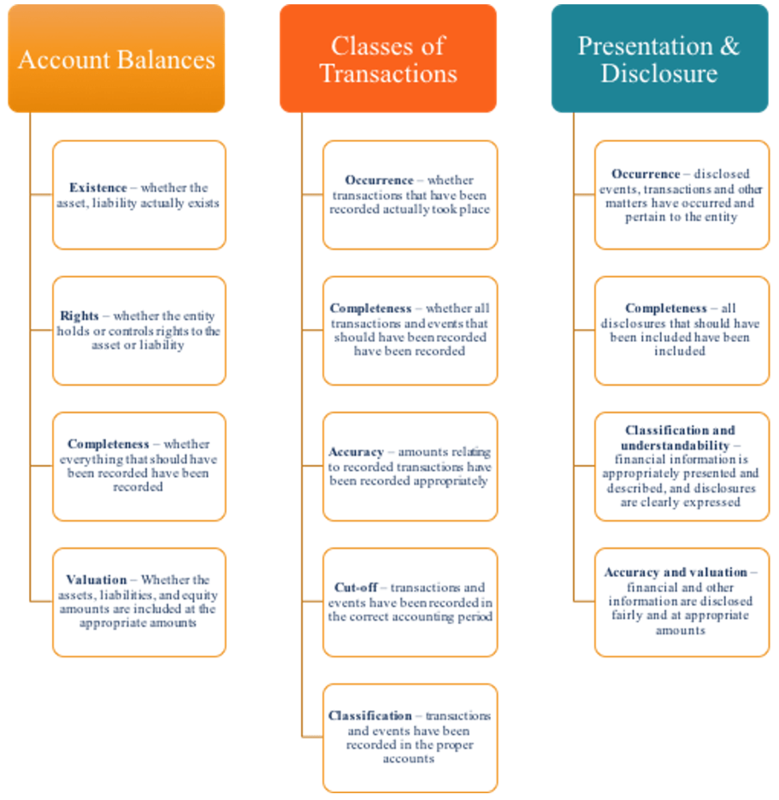 Hence, when preparing financial statements, management makes assertions about each account and its related note disclosures. Auditors then use these assertions for the account balances, classes of transactions, and presentation and disclosures in assessing the risk of material misstatement and designing audit procedures. Assertions are directly related to GAAP. We hope you have benefited from reading CFI’s guide to audit assertion. CFI offers the Financial Analyst Certification ProgramFMVA™ CertificationThe Financial Modeling & Valueation Analyst (FMVA)™ accreditation is a global standard for financial analysts that covers finance, accounting, financial modeling, valuation, budgeting, forecasting, presentations, and strategy. for anyone seeking to become a world-class financial analyst. CFI Financial Analyst Certification ProgramFMVA™ CertificationThe Financial Modeling & Valueation Analyst (FMVA)™ accreditation is a global standard for financial analysts that covers finance, accounting, financial modeling, valuation, budgeting, forecasting, presentations, and strategy.